This is a raw post. I haven't worked it all out yet but I need to. For the last few weeks I have been mulling over a phrase that God dropped into my heart and it has been buzzing round my head. I'm not even sure it makes sense but I believe he said that "I have become comfortable in my uncomfortability." It came as a difficult answer for me to hear to my cry to God for help. A vocational life in church leadership is not for the faint hearted. I have always volunteered in church from my early years but nothing prepared me for the change I experienced when I started "full time" ministry 10 years ago. Church leadership makes you a VERY busy person, and trying to lead a group of Christians, believe it or not can be quite stressful. So asking God for help and assistance when you think you are giving all you can and still standing still. 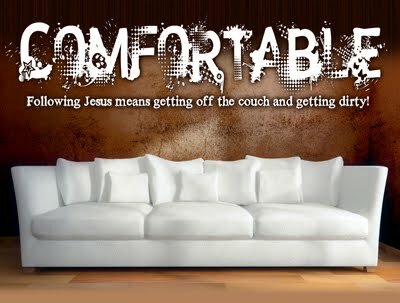 To hear God tell me I have become "Comfortable in my Uncomfortabilty" did my head in. My first reaction was, God, you've got to be joking, I can't give any more! So after I calmed down a little I went back and asked what does it mean for me?. Well at the moment it feels like God is saying Billy, you have become comfortable in your busyness. Because you are using it as an excuse to NOT do the really uncomfortable thing. Listen to God and wholeheartedly pursue the dream he has put in your heart. Not a pale shadow of the dream, do the radical and take the risk. First I want to say how much I enjoy your blog. Being one who is new in leadership, I find your perspective really refreshing and thoughtful. My problem sometimes is tryimg to do too much and not enough delegating which leads me to burn out much faster. Moses' father-in-law Jethro saw that Moses needed help or he would push himself into an early grave. You have to take the risk and do the radical, but have enough wisdom to articulae the vision to able people and spread the work out. Just my thoughts.